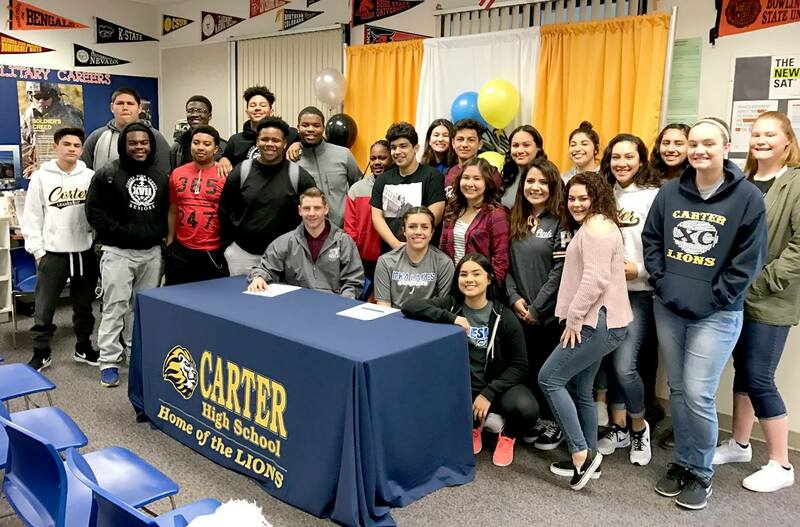 A ROARING SUPPORT… Flanked by their peers, Carter High School student/athlete, CHS Quarterback, Sonny Robison (seated left) will head to the University of Redlands and Carter Girls Softball Player, Alicia Rivera, heads to Iowa Lakes, after graduation. They signed their letter of intent, this morning at Carter High School. As Carter High School Principal, Dr. Patricia Chavez, once stated, “Great, quality coaching/teaching, results in great, quality students”… With that said, this morning, at 7:00 a.m., Carter High School Athletic Department. 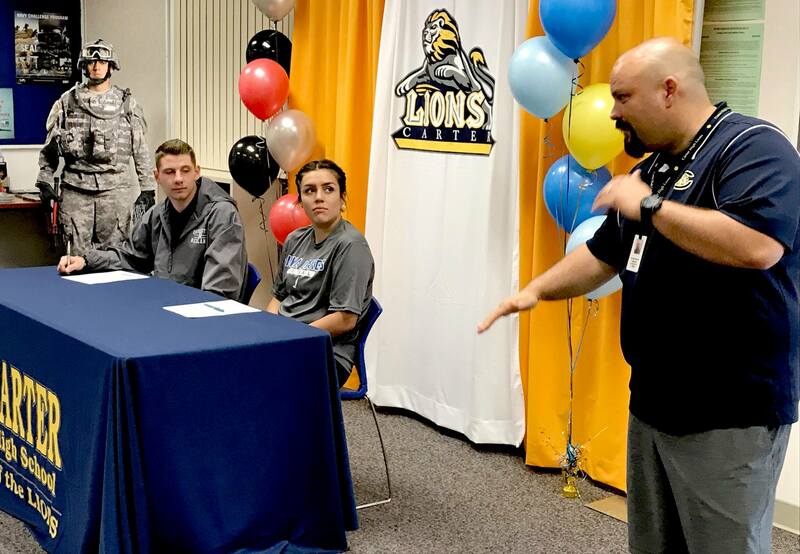 led by Athletic Director, Mr. Kennard Kapono held a full ride scholarship signing for two student-athletes at CHS Career Center. Enjoys some early morning, positive news from the Lions’s Den. 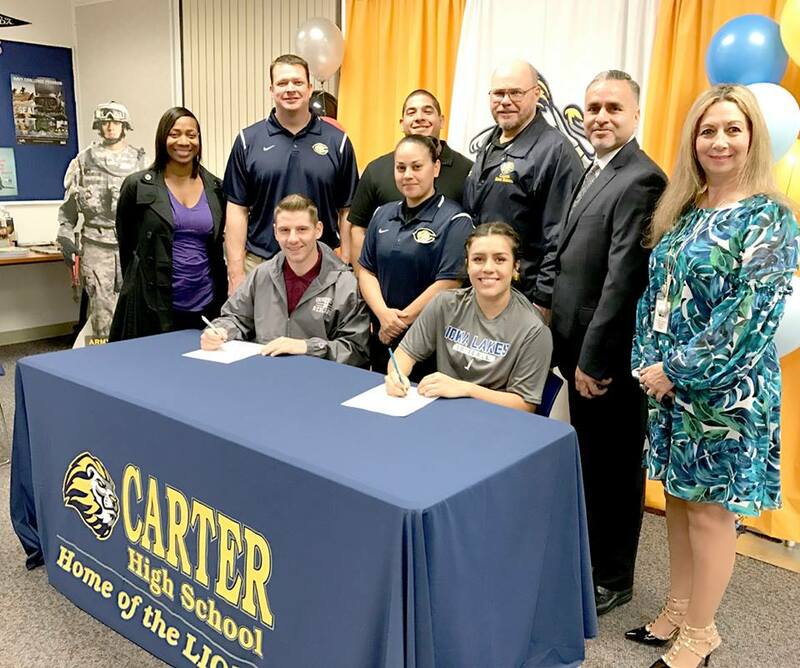 Signing for their future….All smiles as Carter High School student/athletes, Sonny Robison (seated left), CHS Quarterback, signed to attend the University of Redlands and Alicia Rivera, Carter Girls Softball Player, signed to attend Iowa Lakes, after graduation. 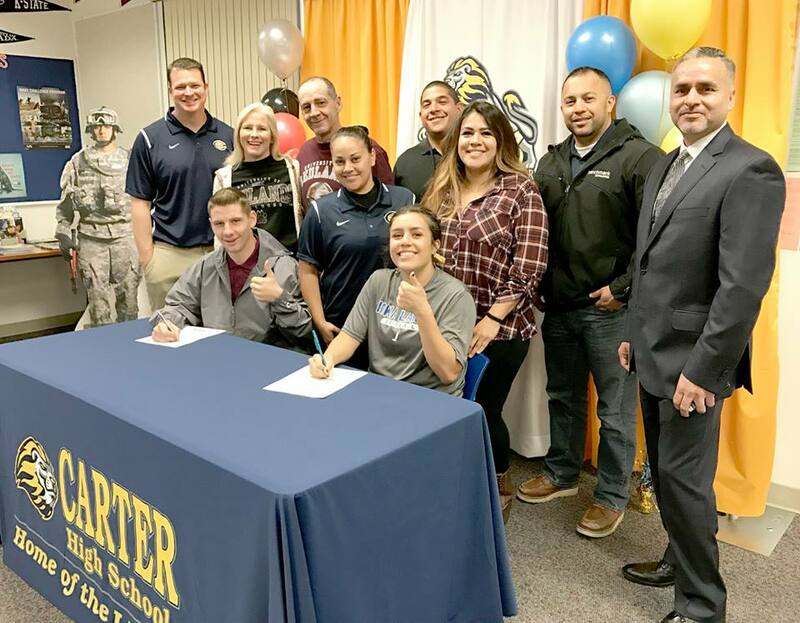 Signing for their future….Carter High School student/athlete, CHS Quarterback, Sonny Robison (seated left) signed a full ride to University of Redlands and Carter Girls Softball Player, Alicia Rivera, heads to Iowa Lakes. They signed their letter of intent, this morning at Carter High School. Pictured from left are Carter High School Head Coach Alex Pierce, Mr. (and CHS Asst. Coach) and Mrs, Robison, Carter HS Assistant Softball Coach, Amanda Alvarado, Head Softball Coach, Omar Fernandez, Mr. and Mrs. Rivera, and RUSD Superintendent, Dr. Cuauhtemoc Avila, who shared with the students that he also played football and baseball in high school. Carter High School Athletic Director, Kennard Kapono describes the students, as they both intently listen. 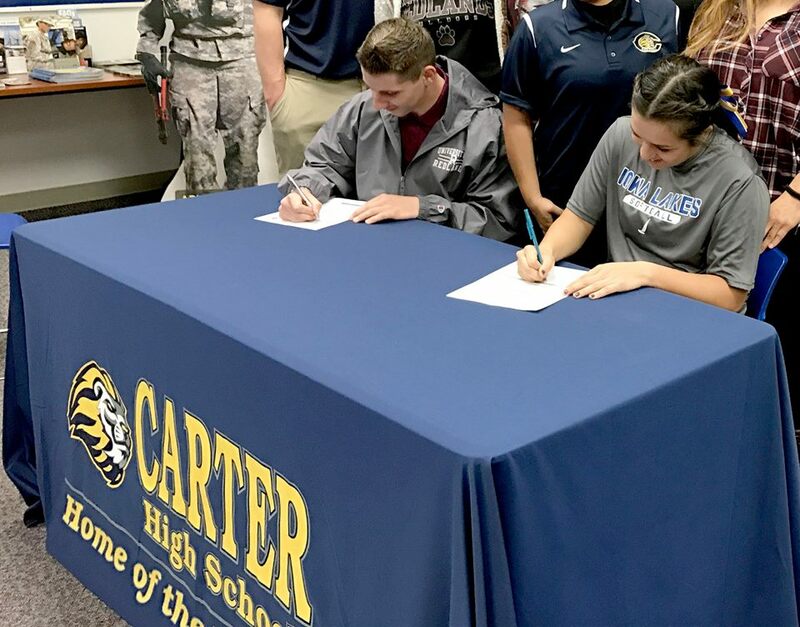 The students, Sonny Robison and Alicia Rivera signed for a full ride, this morning at Carter High School. “These are hardworking, bright, students and we couldn’t be more proud of them, both,” said Carter High School Head Football Coach Alex Pierce(standing far left), Carter High School Assistant Girls Softball Coach, Amanda Alvarado (middle) and Head Softball Coach, Omar Fernandez stands over Carter Girls Softball Player, Alicia Rivera. Rivera will head to Iowa Lakes, after graduation and Robison will head to the University of Redlands on a full ride. 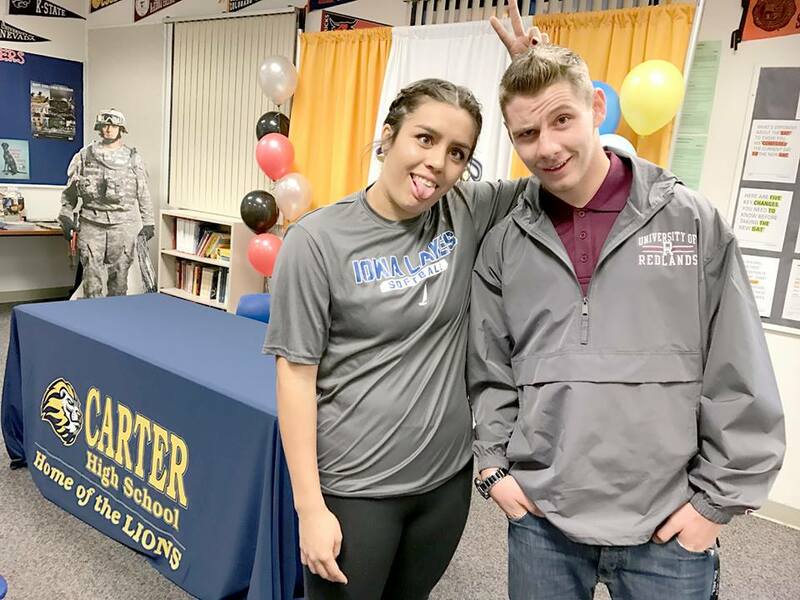 Before signing it’s always fun to just be “a kid.” Carter High School student/athlete, CHS Quarterback, Sonny Robison (who heads to the University of Redlands) gets the bunny ears from Carter Girls Softball Player, Alicia Rivera (who heads to Iowa Lakes). They signed their letter of intent, this morning at Carter High School.